Still a glass ceiling? Tracing the limits to women’s representation in elected office. Is gender equal representation in parliaments right around the corner? A large bulk of empirical and theoretical studies would lead us to expect growing numbers of female office-holders in legislative assemblies (see e.g. Matland 1993; Salmond 2006; Hughes and Paxton 2008; Davidson-Schmich 2007; Caul Kittilson 2006). These researchers argue that societal modernization tendencies continue to transform people’s and parties’ attitudes towards women’s political activity. In addition, women’s representation should unfold as a self-reinforcing process, because female legislators encourage and empower more women to come forward as candidates for legislative ofﬁce. Consistent with these arguments, the world average of women in parliaments is increasing continuously (Inter-Parliamentary Union 2018). However, as Figure 1 clarifies, the steady growth of the world average proportion of female office-holders hides considerable variation: Countries like Australia, Germany, Croatia, Latvia, Mauritius, or Panama experienced decreases at some point during the last decade. 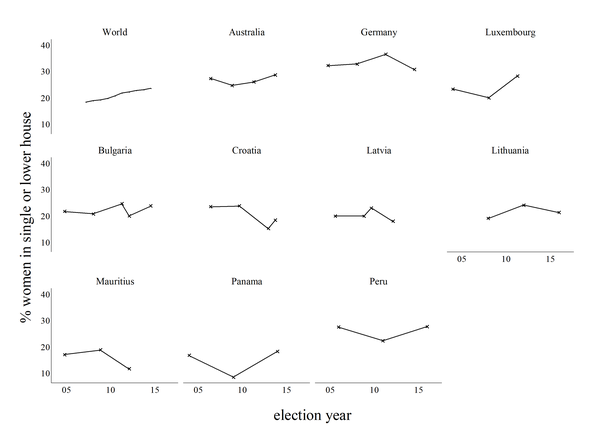 Our recent publication at Comparative European Politics enhances our understanding as to how women’s representation develops over time by looking at the subnational level of government. Figure 1: Share of women in national assemblies between 2008 and 2017. We analyze changes in the share of female legislators in German municipal (Gemeinde), district (Kreis), and state (Land) assemblies between 1995 and 2013 based on the Women and Parties in Germany data set (Eder and Fortin-Rittberger 2017). Our main explanatory variable is the lagged proportion of women in an assembly. Using the differential from one election to the next as the dependent variable instead of the overall proportion of women allows us to abstract away from contextual and time-invariant factors driving the overall level of women’s representation such as the socioeconomic and institutional contexts, as well as overall attitudes. Control variables that influence increases or decreases in women’s representation include i.e. change in the dominant party ideology or party magnitude, electoral formulas, and the level of government. German sub-national assemblies –as national parliaments – display a positive time trend, but also many cases of decreasing proportions of women. Our research reveals that these downturns are not distributed randomly. Instead, whether more women enter office depends on their numerical strength in the previous assembly: Large numbers unfold a negative effect on change in the share of women in the subsequent election, which signals a saturation point for women’s representation. Figure 2 clarifies this relationship by showing the effect of the proportion of women at a first election (t0) on the predicted in- or decrease in the share of female ofﬁceholders at the subsequent election (t1) for the municipal, district, and state level. While the constant (which indicates a positive time trend) varies due to differences in women’s representation across levels of government, the impact of the share of women at t0 remains the same in all three echelons. Assemblies comprising few women at t0 tend to experience considerable increases in the share of female ofﬁceholders in the following election. If a municipal assembly was devoid of women at t0, we predict an increase in the share of female ofﬁceholders of 9.2%-points in the following election. As the proportion of women at t0 increases, the predicted positive change in the t1-election shrinks and eventually ﬂattens. Our models forecast that in municipal assemblies where women constitute 25.5% of the representatives, this proportion will not increase in the subsequent election. This turning point is slightly higher in district and state elections. Independent of the exact threshold, the model predicts negative change from t0 to t1, and thus downturns in the share of women as the proportion of female ofﬁceholders overcomes this saturation point. 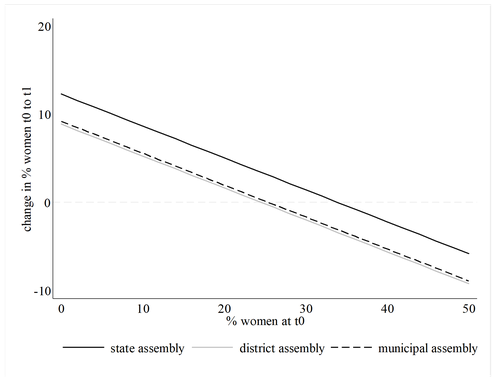 Figure 2: Effect of the lagged proportion of women on change in the share of female representatives in an assembly (t0 to t1). Our findings add to a small but growing body of literature (Leyenaar 2013; Kjaer 1999) which questions the idea that assemblies will reach gender equality over time due to modernization effects and self-reinforcing processes. Instead, there is still a glass ceiling limiting women’s presence in parliaments. While our empirical evidence relates to subnational levels of government, Figure 1 indicates that this finding might also hold for national elections (even though the turning point will likely be much higher). Potential explanations might hinge on the supply and demand sides. On the supply side, women already holding mandates in local assemblies might neither be interested, nor able to keep their mandate in successive elections. Rather than seeking reelection, they could be reluctant to continue running for ofﬁce as local assembly work is often honorary. On the demand side, parties’ recruiting and nomination processes might change in tandem with the proportion of female representatives. Feminist activists in a party can more efﬁciently lobby for increases in the share of women candidates if the number of female ofﬁceholders in parliament is low (Kenny and Mackay 2014, 880). Kroeber, Corinna, Marent, Vanessa, Fortin-Rittberger, Jessica, and Christina Eder. "Still a glass ceiling? Tracing the limits to women’s representation in elected office." Comparative European Politics (2018). DOI: https://doi.org/10.1057/s41295-018-0114-5. You would like to read the whole article? See the free view-only version! Caul Kittilson, M. (2006) Challenging Parties, Changing Parliaments: Women and Elected Office in Contemporary Western Europe. Columbus: Ohio State University Press. Davidson-Schmich, L.K. (2007) Ahead of Her Time: Eva Kolinsky and the Limits of German Gender Quotas. German Politics 16(3): 391–407. Eder, C. and Fortin-Rittberger, J. 2017. Women and Parties in German Assemblies (WaP). GESIS Data Archive, Cologne. ZA5990 Datafile Version 1.0.0, doi:10.4232/1.12725"
Hughes, M.M. and Paxton, P. (2008) Continuous Change, Episodes, and Critical Periods: a Framework for Understanding Women's Political Representation over Time. Politics & Gender 4(2): 233–264. Inter-Parliamentary Union (2018) Women in National Parliaments. Available at: http://www.ipu.org/wmn-e/classif.htm. (Last access: 07/02/2018). Kenny, M. and Mackay, F. (2014) When Is Contagion Not Very Contagious? Dynamics of Women’s Political Representation in Scotland. Parliamentary Affairs 67(4): 866–886. Kjaer, U. (1999) Saturation Without Parity: The Stagnating Number of Female Councillors in Denmark. In: E. Beukel (ed.) Elites, Parties and Democracy - Festschrift for Professor Mogens N. Pedersen. Odensee, Odensee University Press, pp. 149–168. Leyenaar, M. (2013) Netherlands: Gender Balance Here to Stay? In: D. Dahlerup and M. Leyenaar (eds.) Breaking Male Dominance in Old Democracies. Oxford, Oxford University Press, pp. 172–196. Matland, R.E. (1993) Institutional Variables Affecting Female Representation in National Legislatures: The Case of Norway. Journal of Politics 55(3): 737–755. Salmond, R. (2006) Proportional Representation and Female Parliamentarians. Legislative Studies Quarterly 31(2): 175–204.